Training Sgt. Grimshawe’s reputation, and more importantly, his 20 quid, rests on his newest squad of recruits ending their ten-week training course as the top squad in the camp. Unfortunately, it’s full of the most unfit men he’s ever had in his charge, including a hypochondriac, a smug intellectual with no respect for authority, a soft-spoken eccentric, a man with three officers in his family, and a man who got called up on his wedding day and just wants to have a wedding night. Grimshawe decides to train this soft bunch with a light touch, but as the weeks go by, their platoon rating just keeps falling. 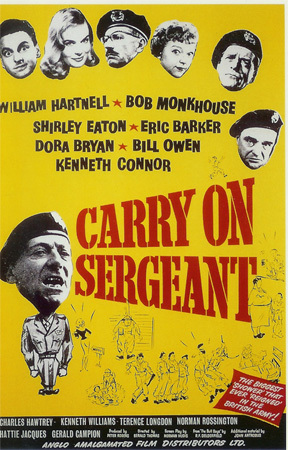 While the sergeant gets top billing and the title role, I was really more expecting an ensemble-oriented story about the men under him, which is what this turned out to be. At first it seemed like the newlywed Sages were going to be a main focus, but once they got their week’s leave for a modest honeymoon, they faded out of prominence. A pair of normals to lead the audience in, I suppose. The real lead character, in my estimation, is Horace Strong, the hypochondriac. I rarely come across a film with so quick a switch from story mode to happy ending mode that doesn’t just leave the ending to a couple of lines’ exposition. While most “ragtag bunch of misfits” stories come to a point where the group finds a way to work together as a team and saves the day in an unorthodox manner, here they just find a cause to rally around and suddenly everything clicks. Even Strong’s personal arc comes to a resolution in the blink of an eye, but at least that’s played for comedy. In both cases, the result is completely unrecognizable from the input. The end, much like the beginning, mainly serves to package the point of the film into a palatable format. There’s a decent feeling of development through the course of the story, but the real purpose here is for the comedy. I was expecting madcap antics, but I got a more thoughtful, witty movie driven by character acting with a fair amount of slapstick. While it’s never very rude or ribald, there is one small moment I found a bit disturbing in a way they wouldn’t have thought of in the late 50s. Overall, this was enjoyable on an entirely different wavelength than I was expecting, and had a higher density of laughs than I’d been led to believe.